Image caption What role can technology play in the ancient art of spice mixing? They're all new spice mix flavours that have been developed by the world's biggest spice firm using artificial intelligence (AI). "My late father Mohanlal was a scientist and inventor and he actually tested each spice and its chemical composition to prepare the masala blends," she says. "My mother would then do the taste test at home - and that made a big difference." Her family's mixes don't contain preservatives or flavour enhancers and are made using traditional grinding methods, with matriarch Bhagvanti overseeing the process and giving the final sign-off. As someone of Kenyan-Indian heritage, I can testify that it's rare for a South Asian family not to possess a masala dabba - a storage box used to create spice blends at home filled with staples such as turmeric, cumin, paprika and asafoetida (hing). Spices aren't just a flavour, they're key to culture, heritage and history. So does AI really have a role to play here? Dr Hamed Faridi, McCormick's chief science officer, says that deep analysis of tens of thousands of previously successful spice mixes is helping the company come up with new flavours more quickly. "A product, from the beginning to the end, can take somewhere between 50 to 150 iterations before it is ready for commercialisation," Dr Faridi says. "It takes an experienced product developer about 10 to 15 years to become highly trained in what they do, so it makes business sense to develop a system that means every person is as good as the best person we have," says Dr Faridi. "In a kitchen [at home] you might have maybe one or two types of fresh garlic and possibly a garlic powder," explains IBM research scientist Dr Robin Lougee. "But a product developer at McCormick will have potentially 50 different types of garlic, all of which are different sizes, different granule sizes, have different flavour profiles. On top of that they have to consider all of the other constraints." These constraints - usually client requirements - can include the need for recipes to be kosher or halal, free from genetically modified organisms, or low in salt, for example, as well as needing regulatory approval. But sometimes the AI isn't all that clever. "In the early days of our collaboration, a product developer was trying to make a Cajun rice dish," she says. "We tried out our suggestion generation engine and it created a great Cajun spice mix, but it left out all the rice. "It hadn't yet learned that you have to take into account the application, so all it had done was create a seasoned salt," she says. Food technology historian Dr Nadia Berenstein says that in a world full of so many food and drink choices there is a "restless search for novelty" in an increasingly competitive industry. And the battleground is flavour. But if you don't have access to commercially sensitive databases produced by the largest spice company in the world, Dr Stuart Farrimond, author of The Science of Spice, has come up with a spice-based periodic table for home cooks. 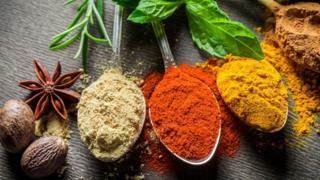 "Spices have always been in demand but there appears to have been a rise in flavour transparency because people are interested in health and also what is going into the food that they are cooking," he says. "AI is just a tool that's available to our generation to be able to do what humans have always done, and that's to explore new tastes and experiences," says Dr Lougee. That may be true, but just don't think of taking away our masala dabba.